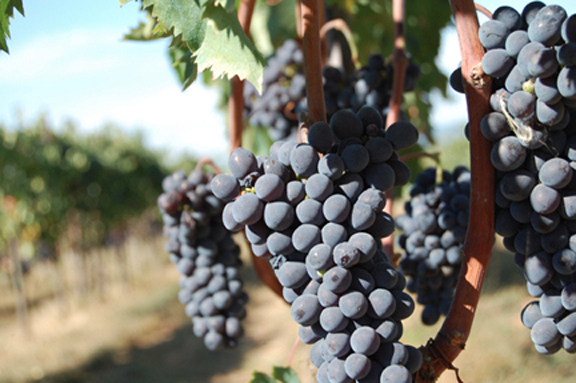 The glorious Sangiovese grape, the variety behind some of Italy’s greatest wines. A few weeks ago, the great American wine writer Eric Asimov, who writes a weekly column for the New York Times, outed himself on social media. The answer: Sangiovese, Italy’s quintessential red grape, grown in every one of Italy’s 20 regions, and vinified most famously in Tuscany, where it is used to make some of the most coveted wines in the world. One of the things that makes Sangiovese so unique is the fact that it is a thin-skinned but tannic red grape (wine gets its tannin from the skin of the grape). As a result, it can produce a wine that is light in body but that also has great nuance and structure, as they say in the wine trade. The other thing about Sangiovese is its unmistakable plum and red fruit flavors that make it a favorite pairing — in Italy and beyond — for roast and grilled meats. The best known “expression” of Sangiovese is Brunello di Montalcino, an appellation where it is vinified as a monovarietal wine, in other words, a single-grape wine. Alessandro Bindocci, the winemaker behind Mazzoni Toscana Rosso, produces one of the most prestigious Brunellos at the estate where his family has worked for four generations, Tenuta Il Poggione (Eric is a big fan of their wine). But knowing that wine lovers can’t drink Brunello every night (it’s really a “special occasion” wine), Alessandro created the Mazzoni Toscana Rosso — a blend of Sangiovese, grown on the same estate where the Brunello is produced, and Merlot — to give Sangiovese fans a more approachable, ready-to-drink version of his family’s wines. The young Sangiovese vines used to make it give the wine the zinging vibrancy and freshness that you need in a food-friendly wine. And the Merlot gives it some extra depth and nuance. For more than three years, Mazzoni — a renowned producer of some of Tuscany’s most acclaimed wines, including its flagship “Super Tuscan” — has blogged about the Italian way of life on LiveLikeAnItalian.com, sharing invaluable insights into how to live, love, eat, drink, cook, travel, speak, and celebrate like an Italian.